After two years in the job, Myanmar’s President U Htin Kyaw resigned last Wednesday. The 71-year-old has been in poor health for some time. A close confidante of Daw Aung San Suu Kyi, U Htin Kyaw was a steady and stable hand. His resignation highlights the growing problem of ageing leadership in the government’s ranks. U Htin Kyaw held a symbolic role as the first elected civilian president in Myanmar in over half a century. Under the constitution, the first Vice President, the military appointed U Myint Swe, steps in as interim President. The power-sharing relationship has worked for the Tatmadaw, and a smooth transition should be expected. All bets are on U Win Myint to be picked as the next president. On Wednesday he resigned as Speaker of the House of Representatives, allowing him to accept the nomination. On Friday he was elected as Vice President. The Parliament must elect a new president from one of the three vice presidents before Wednesday. A lawyer and former political prisoner, U Win Myint has proven himself a capable, straight-talking politician and close confidante of Aung San Suu Kyi. Little is likely to change under a U Win Myint presidency. Those that hope for some redirection of policy on the Rohingya are likely to be disappointed. Despite being a capable Speaker, under his leadership there was little discussion of Rakhine state in the lower house. A new face, however, brings the chance for a different relationship between the president and Aung San Suu Kyi. A more tense relationship, or one in which the president has greater opportunity to speak freely, may push debate and speed up reforms – but that may be too hopeful. The real story isn’t about the resignation of the President or his replacement, but rather the ageing leadership of the ruling National League for Democracy. For months, the NLD government has warned journalists not to comment on the health of the President or other officials. It has been one of an increasing number of no-go areas for journalists. This is unproductive but not wholly unsurprising. The NLD stalwarts who fought so long and hard for change in Myanmar are ageing. U Win Thein, the 75-year-old “Godfather” of the NLD, stepped down in January from his executive role in the party due to ill health. U Tin Oo, the nonagenarian co-founder of the NLD, has been gravely ill since last year. His colleague and former party chairman U Aung Shwe passed away last year. Aung San Suu Kyi has been stricken by illness repeatedly – the Lowy Institute event in March was only one of many scheduled addresses cancelled or postponed due to poor health. On Sunday, amid rumours of her imminent retirement, her party was forced to issue a denial. The incidents of poor health and mounting rumours provide all the more reason why 72-year-old Daw Aung San Suu Kyi and the party she has fought for must make strides to ensure her legacy and the continuation of Myanmar’s transition to democracy. In the two years since coming to office, the NLD has maintained its grip on the relative power it’s been allowed by the military. The party leadership has rewarded those who for so long fought for change. That was appropriate and expected after the landslide victory; but now a new and younger generation of NLD faithful need to be groomed, and publicly, to ensure the party’s future and prevent backsliding. This isn’t happening nearly enough. In fact, the NLD’s top-down, disciplinary approach to government may be pushing some of the younger generation away. As Renaud Egreteau notes, “many new parliamentarians feel they are being scolded by senior NLD officials as if they were unruly schoolchildren”. In Myanmar, particularly in Buddhist society, age is respected. Now, however, there are myriad opportunities for bright young mid-career NLD cadre. Their obedience may wear thin if they cannot see career opportunities on the horizon. If the NLD’s replacement in the House of Representatives is any indication, many both inside and outside Myanmar will be disappointed. Nominee T Khun Myat, an ethnic Kachin, headed the Kutkai militia for two decades. The militia was linked to the drug trade and operated under the command of the Tatmadaw. When T Khun Myat was initially elected as a member of the military-founded Union Solidarity and Development Party, some reports suggested his militia had forced people to vote for him. There have long been allegations (see here) that the new Speaker was deeply involved in the narcotics trade – allegations T Khun Myat denies. 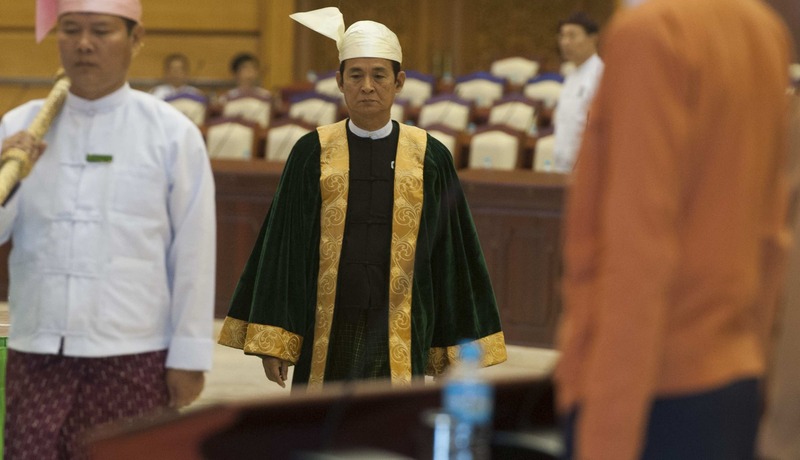 His elevation to Speaker of the House will displease many and augurs poorly for those that the NLD should be looking to promote. What the past week’s events highlight is an ageing leadership with no clear or comprehensive vision or succession plan. One remedy would be a speech which clearly lays out Daw Aung San Suu Kyi’s vision for Myanmar, which could act as a unifying legacy document were she to fall ill.
Whatever trouble the country finds itself in now, it would be far worse off without Daw Aung San Suu Kyi. The question remains, who will continue her legacy?